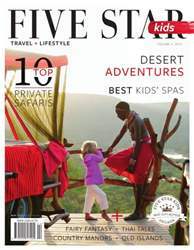 (0 Customer Reviews) | Write Review 3 issues per year Catering to the ever-increasing niche of well-travelled, discerning families who seek quality experiences and unique adventures during their precious family time. Five Star Kids supplies families that want the best from their travels with information on the most luxurious destinations suitable for children, and on the most exciting experiences available for families. Time-poor but cash-rich parents are increasingly opting for luxury holidays that can still provide their children with fun and educational activities. Some may also want time alone while their children are well looked after in quality childcare facilities that engage them and provide enriching cultural experiences. Five Star Kids showcases a world of holidays where the whole family can have fun together in style. However, travel is only one section of the magazine. Lifestyle issues such as fashion, party planning, dining and interior design are also covered, as is the critical topic of education. 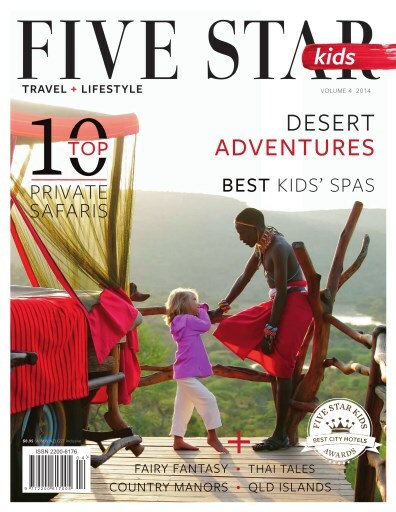 Packed full of the latest and greatest travel and lifestyle information for luxury-loving families, Five Star Kids is the only publication of its kind. With beautifully designed feature articles on destinations spanning from ski to surf, both near and far, and the latest in luxury fashion, lifestyle and education, five star families will be truly inspired. Our latest issue features the first-ever Five Star Kids Awards – Best City Hotels, so you’ll never be stuck for somewhere luxurious to rest your head when visiting the big smoke. We also show the wild-side of luxury with the most exclusive family-friendly safari houses and have perfect autumn fashions from Queensland designer, Possum and Banjo. Catering to the ever-increasing niche of well-travelled, discerning families who seek quality experiences and unique adventures during their precious family time. Five Star Kids supplies families that want the best from their travels with information on the most luxurious destinations suitable for children, and on the most exciting experiences available for families. Time-poor but cash-rich parents are increasingly opting for luxury holidays that can still provide their children with fun and educational activities. Some may also want time alone while their children are well looked after in quality childcare facilities that engage them and provide enriching cultural experiences. Five Star Kids showcases a world of holidays where the whole family can have fun together in style. You'll receive 3 issues during a 1 year Five Star Kids magazine subscription. You'll receive 3 issues during a 1 year Five Star Kids magazine print subscription.